Was there, browsing for The Aviator dvd at Sanity when this special deal they had pinned on a scrap of paper up on the wall kind of caught my eye. Picked out my four dvds and made off with the free dvd player I've now got set up in my room/office area. One of the movies I decided upon was the original version of Alfie. Having thoroughly enjoyed the one recently made, I wanted to see what the old one was all about. 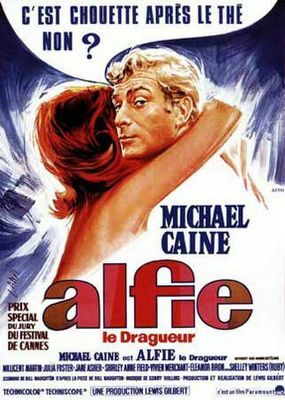 However upon returning home and looking inside the case, at first thinking how extraordinarily different and Jude Lawish the young Michael Caine looked, I realised that the girl behind the counter had unwittingly mistaken Alfies and given me the wrong disk. There was a long haired, balding, slightly overweight old man standing to the side, yesterday when I went to exchange the disk. While the young guy behind the counter asked the rather silly question of if I was sure it was the wrong one, the old guy remarked with a smile how much he liked the old one, and wasn't too keen on the new. I've just finished watching both films and though the two Alfies - the characters I mean - are incredibly similar with their certain looks and mannerisms shared through so much time, their surrounding world seems so different, updated for the changing times. And still they walk the same lonely path. My preference I must say, a product of my age, is for the new. "It's nice after tea, isn't it?" I agree with you. I prefer the newer version as well. Perhaps I like Jude Law better and am biased to what I can identify with.